Never install a wire instead of the proper fuse – even as a temporary repair. It may cause extensive wiring damage and possibly a fire. 2. Using a key, remove the fuse box cover. 3. Pull the suspected fuse straight out. Use the removal tool provided on the cover (if equipped). Refer to the fuse panel chart on the fuse panel cover to identify the likely problem fuse or electrical circuit. 4. Check the removed fuse; replace it if it is blown. The number of fuses vary according to the vehicle model. 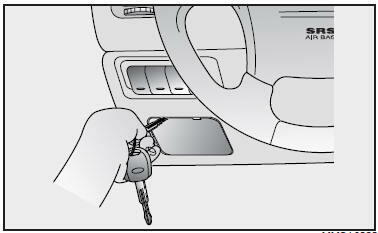 Check both the passenger and engine compartment fuse box covers. If you do not have a spare, use a fuse of the same rating from a circuit you may not need for operating the vehicle, such as the radio or clock (Room) fuse. 2. Remove the fuse block cover by unhooking the tab on one end and tilting the cover back toward the other end. 3. Check the fuses. If one is blown, replace it with a new one of the same rating. 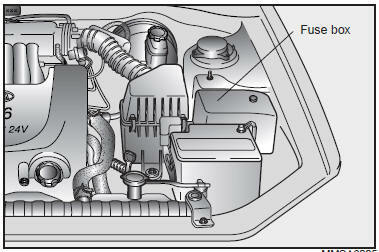 After checking the fuse box in the engine compartment, please securely install the fuse box cover. If not, electrical failures may occur from water leaking in.